This is an old family recipe. My mom’s grandma would make this every spring just as the green beans came up in the garden. It’s a great, easy recipe that’s total comfort food. I actually made this using a frozen ham hock that we saved from Easter. 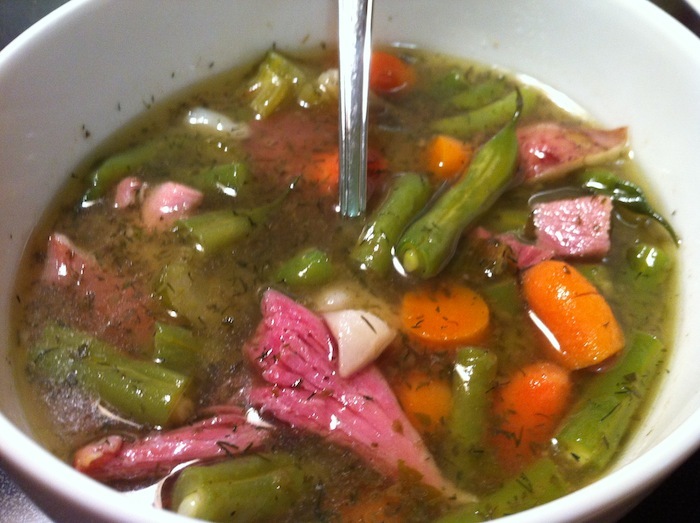 You can also just buy a ham hock at the store, or make this soup whenever you’re making a ham and freeze it for later. If green beans aren’t in season, you can use frozen green beans, just throw them in in the last few minutes and cook until heated through. In a large stock pot, combine ham hock, water, salt, bay leaves and dried parsley. Bring to a boil, then let simmer for about two hours, stirring occasionally. Remove the ham hock from the pot and let cool. Pick any remaining ham off the bone and reserve for later. Add potatoes and cook for about 15-20 minutes, or until beginning to get tender. Add onion, carrots, and celery and cook for an additional 10 minutes, or until vegetables are fork-tender. Add green beans and ham to the pot and cook for about 8 minutes, or until green beans are bright green and tender and the ham is heated through. Add dill, taste and adjust seasoning as needed. Serve with a dollop of sour cream.